"Takes a slice of mid-twentieth-century Americana and exposes it as an utter and ongoing gender inequality nightmare. Electric, tense, horrifying, and a righteously angry yowl." --Paul Tremblay, author of A Head Full of Ghosts and The Cabin at the End of the WorldAt seventeen, June Hardie is everything a young woman in 1951 shouldn't be--independent, rebellious, a dreamer. June longs to travel, to attend college and to write the dark science fiction stories that consume her waking hours. But her parents only care about making June a better young woman. Her mother grooms her to be a perfect little homemaker while her father pushes her to marry his business partner's domineering son. When June resists, her whole world is shattered--suburbia isn't the only prison for different women...June's parents commit her to Burrow Place Asylum, aka the Institution. With its sickening conditions, terrifying staff and brutal "medical treatments," the Institution preys on June's darkest secrets and deepest fears. And she's not alone. The Institution terrorizes June's fragile roommate, Eleanor, and the other women locked away within its crumbling walls. Those who dare speak up disappear...or worse. Trapped between a gruesome reality and increasingly sinister hallucinations, June isn't sure where her nightmares end and real life begins. But she does know one thing: in order to survive, she must destroy the Institution before it finally claims them all. 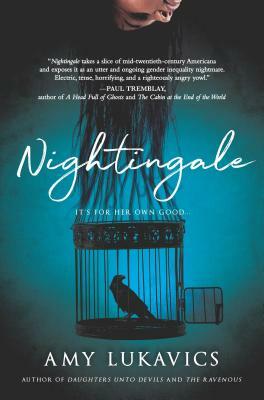 "Nightingale is a beautifully constructed novel featuring out-of-this-world suspense, a classic Stephen King vibe and an edge all its own. If that wasn't enough, its powerful portrayal of gender roles and feminism makes it all too timely and important."